This is the process for uploading recordings from Zoom to Google Drive so we can add them to the members' website for those who miss the live calls. We use Hazel to automate a lot of this process so it's important you follow this process accurately. A lot of our members cannot attend coaching calls or webinars at the time of broadcast, so we make them available for them to watch in the members' website and to download and watch offline. One of our members built a $50K per year side business while commuting to and from work on the train everyday and has now quit his job and moved his family up north for better weather and to ramp up his freelancing business. So this stuff is important. If you do not have access to these resources, please contact Troy or Gin and request access. When complete, this process triggers a new checklist for Michelle to upload the call to the members' website using Zapier. 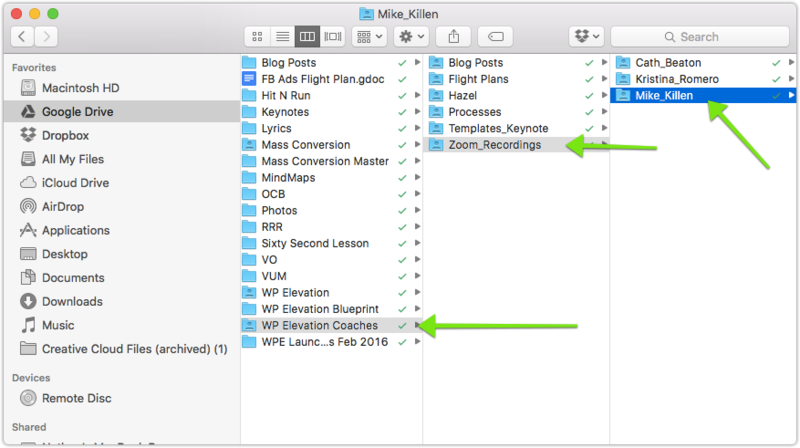 Open your specific folder in Google Drive for uploading Zoom recordings. Move the entire subfolder containing the Zoom Recordings from your Documents > Zoom folder into your Google Drive folder. NB: It's important that you move the entire folder and not just the individual files as Hazel runs an automation based on the existence of a subfolder, so if the subfolder does not exist, Hazel will not do her job. As part of the automation Hazel will remove the entire subfolder from your Google Drive folder, so your Google Drive folder should remain clean and uncluttered for your next recording. 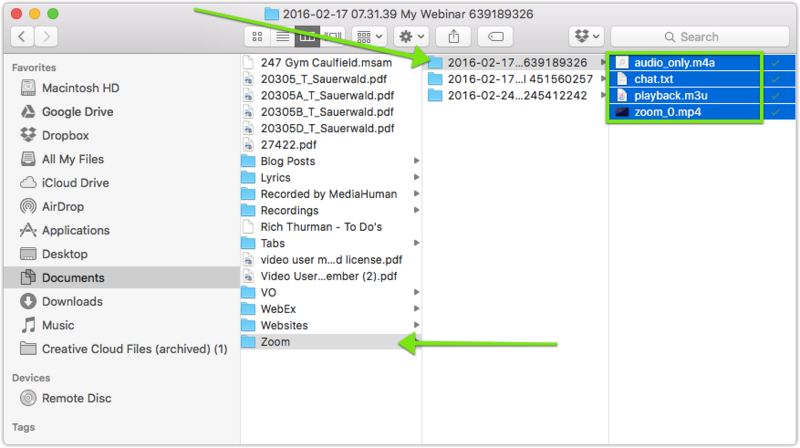 Move the entire subfolder with the recordings into your Google Drive folder, not just the individual files. 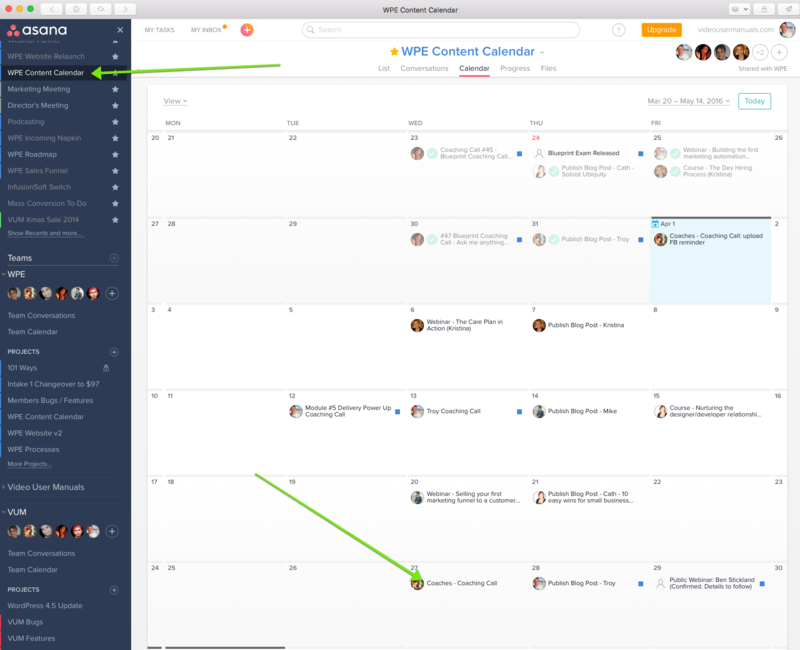 Login to Asana and find your coaching call in the WPE Content Calendar. 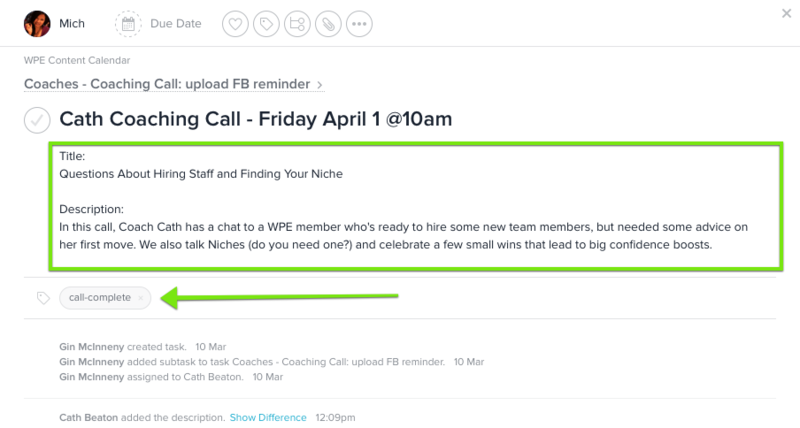 Find your individual call or webinar and click on the comments icon. Apply the tag “call-complete” to the task. I know this is boring but it really helps us to keep things consistent. NB: if you have any additional files you want to add to the members website for your coaching call or webinar please just add those files to the Asana task for your call. Assign the task to Michelle in Asana. Here is the official help article from Zoom about recordings. Here is some documentation for Hazel if you are interested. You will know this process is complete when you have uploaded the folder to Google Drive and tagged the call in Asana as "call-complete". If you are satisfied, tick this off and stand up and stretch.